Last week I had the opportunity to tour a group of college students around Ireland during our spring break, helping them understand the complex history of this small nation that so many Americans claim as part of our heritage. The country was in full pre-party mode, as we saw signs of the coming celebrations of St. Patrick’s day throughout our time in Galway, Cork, and Dublin. But despite the generally celebratory air that pervaded Ireland last week, the hard lessons of Irish history never seemed far from reach. You can’t dig very deeply into Ireland’s past without encountering the effects of the potato famine that struck the island in 1845, and continued for several years afterward. The Irish people had become heavily dependent on the potato as their primary food source in the first half of the 19th century; when a blight struck the potato crop, destroying whole fields literally overnight, it had devastating consequences. A million Irish people died as a result of that famine; another million emigrated to England, Canada, and the US. 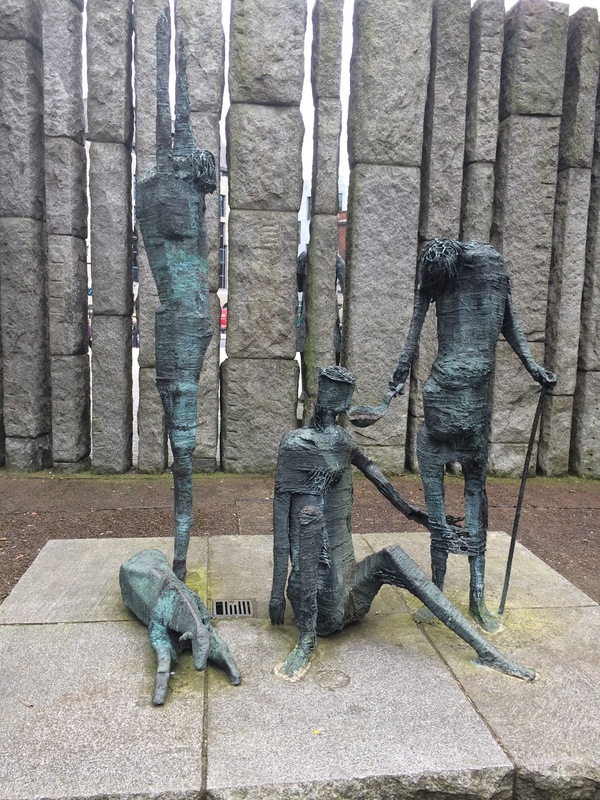 The Irish population peaked at eight million on the eve of the famine; fifty years later, with the country still reeling from the effects of starvation and emigration, the population had dropped to four million. 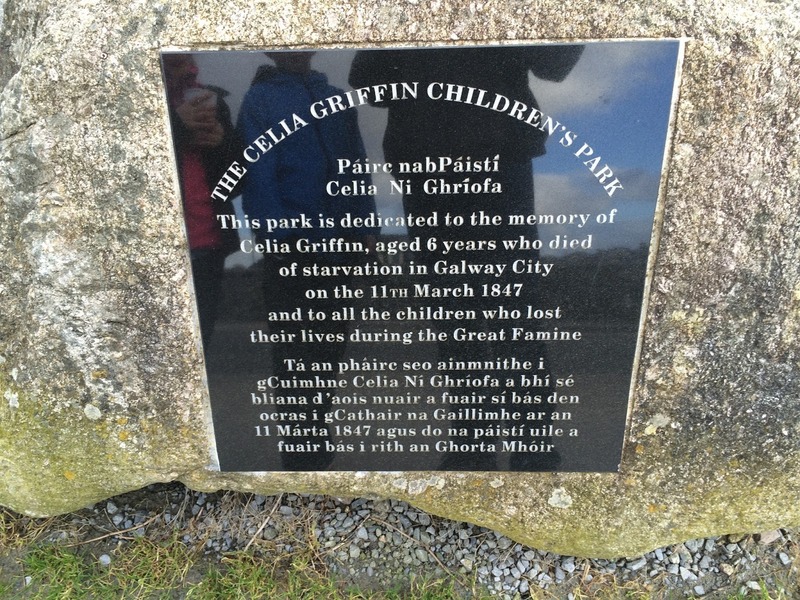 More than 150 years later, the famine still lives very close to the surface of Irish consciousness. We spent time with at least a half-dozen tour guides at different sites throughout our stay, and every single one of them discussed the way the famine has shaped Irish political history, Irish music and literature, and even Irish awareness of hunger and famine around the globe. 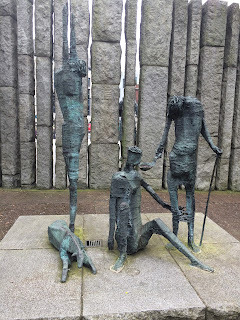 We saw famine memorials everywhere we turned: a plaque on a beach boulder in Galway, a moving tribute near the small town of Lahinch, skeletal sculptures of famine victims slouching along the river Liffey or crouched in the corner of St. Stephen’s Green in Dublin. St. Patrick’s Day provides an opportunity for Americans, like the Irish, to celebrate the many contributions that the Irish have made to our western cultural heritage. But we should take the time during this celebratory week, especially during a presidential election season, to remember that the Irish potato famine was more than just an unfortunate botanical event: it was a natural disaster that was deeply intensified by a blind and unwavering commitment to unregulated, free-market capitalism. When the famine struck, Ireland was in political union with England. England thus should have born the responsibility for providing relief to its own citizens in the face of the starvation that the Irish people experienced during the especially intense famine years of 1845-1848. They had the ability to do so, as many historians have pointed out. Ireland had plenty of food in the country throughout the famine years, in the form of grains that were grown on large farms and exported to other countries. The English government attempted famine relief in fits and starts, using a combination of soup kitchens, public works programs, and imported maize to be sold to the people at very low cost. More simple and effective solutions to the starvation of millions of people would have been to allow the Irish people to eat the grain they were farming for export or for the English government to purchase food from abroad and distribute it to the starving Irish peasants. England, however, refused either of these courses of action—and we have ample evidence for their reasons. Trevelyan believed that if the government gave away food to the Irish people, it would unfairly punish the merchants who sold food. Such interference in the free market, he argued, was never warranted. When government officials in Ireland sent to Trevelyan accounts of Irish children starving to death in the streets, and asked him for food that they could dispense to the people, Trevelyan responded by sending them copies of Edmund Burke’s Thoughts on Scarcity, an economic tract that argued against a previous government scheme to provide an early version of a minimum wage to agricultural workers. Laced throughout Trevelyan’s belief system was the judgment that providing government assistance to people in economic distress would lead them to become dependent upon government: “If the Irish once find out there are any circumstances in which they can get free government grants, we shall have a system of mendacity such as the world has never seen.” Instead, Trevelyan believed, the government should encourage the Irish people to lift themselves up by their own bootstraps and the problem would solve itself. And solve itself it did, but not in the way they expected. While the English government sat back and waited for free-market capitalism to rescue Ireland from its famine, a million people died of starvation, typhus, cholera, and a host of related medical problems. Families laid in their cabins and died together, children in the arms of their parents. Landlords evicted tenants who could not afford their rents, and left them to die in ditches. Dogs dined on corpses in the streets. The toll of suffering was indescribable. 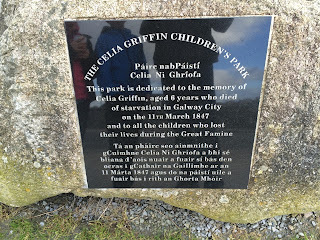 The names of Charles Edward Trevelyan and the other English politicians who allowed this famine to occur live in infamy in Irish history. But I would contend that the real culprit in the famine was less any single individual and instead a blind adherence to the tenets of free-market capitalism—a shortsighted conviction that still infects our political discourse today. Too many Americans believe that the government should get out of the business of interfering in markets or providing relief to its poorest and most vulnerable citizens. Many of those Americans are the same ones whose ancestors suffered through the famine years as the result of those exact same sentiments. The free market has many blessings to bestow upon us. But when we treat it as an untouchable idol, we lose sight of the fact that markets don’t care for individuals; they have no obligation to help the most vulnerable among us. We also cannot count on private charity to bear the burden of caring for those who live on the margins of the market. The English government hoped that Irish landowners would step up to save their fellow citizens with their charity; instead, those landowners took advantage of the famine to clear starving tenants from their farms and make room for those who could afford to pay their rents. On this St. Patrick’s Day, Irish-Americans owe it their heritage to remember the lessons that their history has bequeathed to us. When we hear politicians arguing that the government should get out of the way of the markets, or that we should quit giving handouts to the poor and let them fend for themselves, we should hear in those words the echoes of Trevelyan and his contemporaries. We should be careful, in our language and in our actions at the polls, not to repeat the mistakes of the past.